The Dodgers are still a long way from the 25-man roster, but the second round of cuts trimmed four from the roster in the form of Jack Murphy, Stetson Allie, Fabio Castillo, and Wynston Sawyer, all NRIs who were reassigned to minor-league camp. Murphy was probably the most well-known of the bunch thanks to his mustache, but in limited playing time this spring, he went just 1-for-10 while serving as catching depth. Converted pitcher Allie did decently well this spring in his chances, going 4-for-19 with a homer and two doubles, but he never stood a chance of breaking camp with the team. Sawyer, who I honest-to-god don’t know at all, went 2-for-7 this spring as a catcher who was behind even Murphy. Castillo pitched eight innings this spring, allowing a decent four earned runs (six total), but walking four and striking out just five. If it’s not obvious by those blurbs, none of them were expected to come close to making the team, so this was expected at some point. 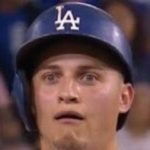 Still, the Dodgers have to trim 28 more players from the roster, and the decisions are gonna start to get awful difficult once they get down to 35 or so.